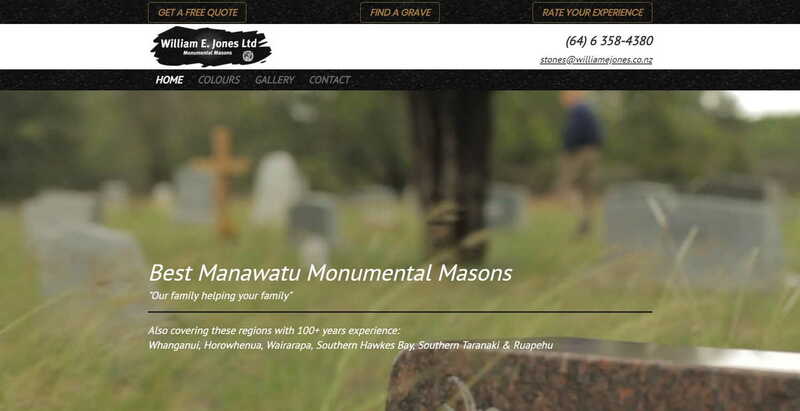 William E Jones Ltd made the headstone for Ian's father in 2001. When his Mom died, we needed the stone to be updated with her details. Ian contacted the company to arrange this, then realized they didn't have a website. Being the cheeky Kiwi (New Zealander) he is, he hit the owner up about it and worked our a deal with him. We looked at the competition and got some good ideas from them and incorporated some of the ideas into Jones's new site, plus added more of our own. We added an extensive gallery of both stone colors and finished projects. The header image on the home page is actually a short, looping video that adds a wonderful ambience to the site. The company didn't have a logo, so we put together one for them. The logo uses the black granite pattern for it's background done in a stylized stone look.